Mussel is a type of shellfish that can be found along coast in Japan as well as other coastlines bordering the ocean. Japanese mussel is taken primarily from the Chiba, Tottori, and Tokushima prefecture. 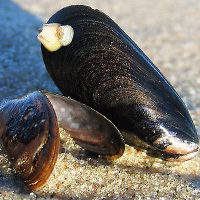 Proceed with caution when gathering clams keeping in mind that mussels can be poisonous gathered out of season. The calories in Mussel per 12g(1item peeled) is 8 calories. Mussel is calculated to be 70Cal per 100 grams making 80Cal equivalent to 114.29g with 1.24g of mostly protein、0.38g of carbohydrates、0.17g of fat in 12g while being rich in vitamins and minerals such as Vitamin B12 and Vitamin B2.